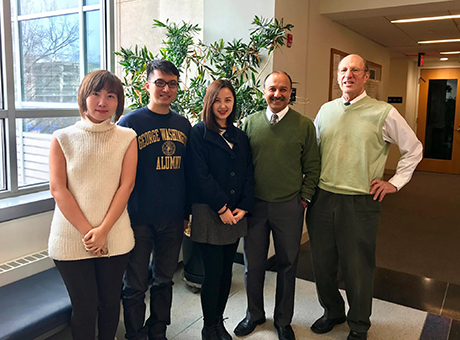 Professors Maggie Chen, Sumit Joshi, and Tony Yezer welcomed Tian Weng and Jane Zheng, two of our MS program alumni visiting from Shanghai! Welcome to the spring newsletter! There have been several interesting events since our fall newsletter. The Fall 2016 Alumni Lecture was delivered by Charlene Kalenkoski who received her undergraduate and PhD degrees from GW. The Spring 2017 Alumni Lecture was delivered by James Bullard, president and CEO of the St. Louis Fed. 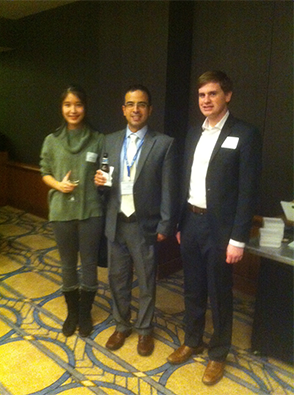 The department hosted a well-attended alumni reception at the 2017 ASSA Annual Meetings in Chicago. The department was also engaged in recruitment at the annual meetings and we will be welcoming two new assistant professors this coming fall: Tomas Williams (International Finance) from the Universitat Pompeu Fabra, and Bryan Stuart (Public Economics) from the University of Michigan. We will also be welcoming Pao-Lin Tien from the Bureau of Economic Analysis as our new director of undergraduate studies. Our faculty and students have continued with their successes and the newsletter lists some of their accomplishments. We are grateful to alumni and friends whose generous donations have contributed to the success of our students through funds for conference travel and awards. Professor Charlene Kalenkoski, BA ’96, MPhil ’99, PhD ’02, directs the PhD program in Personal Financial Planning at Texas Tech University. Delivering the Fall 2016 Alumni Lecture, Charlene demonstrated her ability to convey economics in a way that was both amusing and entertaining with her discussion of the economics of time usage, an area where she is one of the foremost experts. She is currently working on time use by seniors during and after transition into retirement. 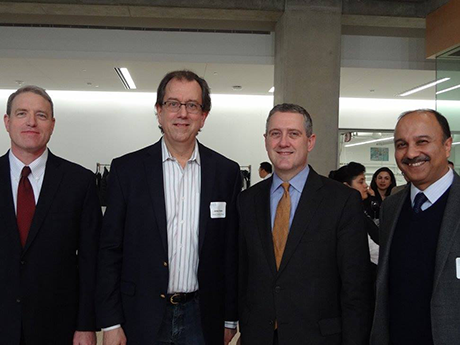 GW alumni gathered on campus to listen to Federal Reserve Bank of St. Louis President James Bullard discuss the Fed's balance sheet policy and the current low interest rate regime. To see Dr. Bullard's comments from the event, please visit his website. 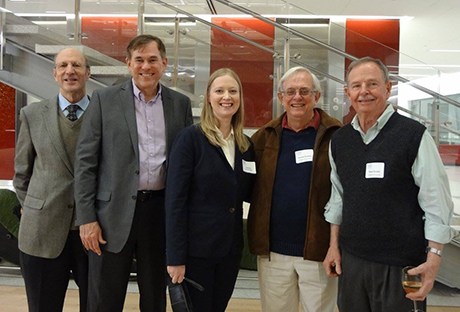 Before the event, Dr. Bullard met GW alumni from the classes of 1966 to 2016 during a networking reception in the newly built Science and Engineering Hall. To find out more about exciting future events, please join the GW Economics Alumni Group on LinkedIn, where you can connect with economics alumni from around the globe. 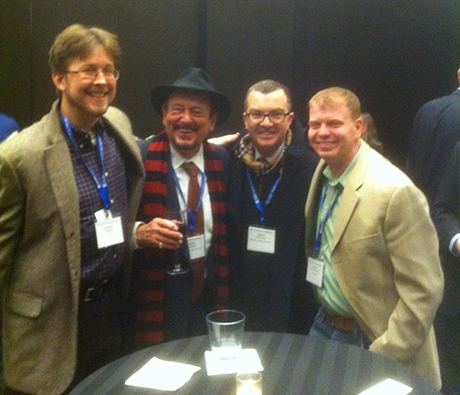 Continuing a “tradition” that began last year in San Francisco, the Department of Economics held a reception at the ASSA meetings in Chicago in January 2017. Over 50 of our GW alumni braved temperatures that never got above 19 degrees Fahrenheit to attend. Some recent GW BS graduates who are currently doing well in graduate school—Jane Olmstead-Rumsey (Northwestern), Red Davis (Duke) and Anh Nguyen (Columbia)—were able to take time out to attend. 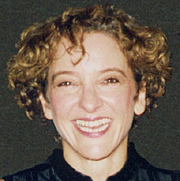 Professor Graciela Kaminsky is the recipient of the 2017 Oscar and Shoshana Trachtenberg Prize for Scholarship. Professor Kaminsky’s research area is in open-economy macroeconomics and international finance. Her research has investigated the causes of financial crises with particular attention to currencies crises, the links between banking and currency crises, sovereign debt crises, financial contagion and early warnings of crises. Her research has also concentrated on cycles of international lending and their role on triggering procyclical monetary and fiscal policies and amplifying business cycles in the periphery as well as in fueling global and regional crises. Professor James Foster was installed as the Oliver T. Carr, Jr. Professor in International Affairs. Congratulations to #GWU economics major and GW women's tennis athlete Marie-Louise Decamps Class of 2018! She has received a 2017-18 GW Undergraduate Research Award! Under the guidance of Professor Arun Malik, she plans to conduct research on the determinants and success of recycling in NYC. Professor Joann Weiner gave a presentation on "Transforming Ideas Into Economic Policies" to a group of European government officials, business leaders, journalists and NGO representatives. 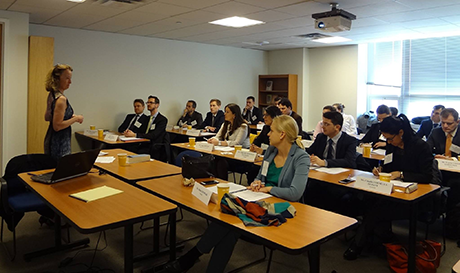 Attendees were participating in "The Contemporary U.S. Economy" program arranged by the Institute of International Education (IIE) on behalf of the U.S. Department of State's International Visitor Leadership Program (IVLP). 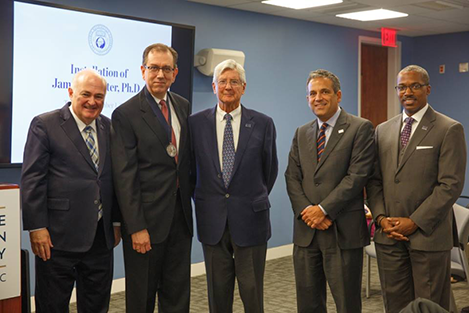 Stuart Harshbarger, MPhil ’93, PhD ’94, received GWAA's Alumni Outstanding Service Award, for his volunteer efforts in support of the university and the GW Economics Department. Read more. Sameer Aggarwal, BA ’15, was recently admitted to Harvard Law School. He expects to matriculate this fall. Enitan Aigbomian, BS ’15, travelled to Bolivia after graduating to volunteer with a nonprofit in La Paz. Afterward she obtained a position within the nonprofit's stateside headquarters. She is returning to La Paz before enrolling in graduate school this fall. Cigdem Akin, PhD ’09, is a public management economist at the South Asia Department of the Asian Development Bank, based in Manila-Philippines. Andrew Avitabile, BS ’15, recently started at MDRC, a nonprofit that evaluates public policy, after two years working in economic consulting. He joins MDRC as a technical researcher in the young adults and post-secondary education policy area. Jennifer Baka, BS ’00, began a new faculty position as an assistant professor of geography at Penn State University in July, 2016. Katherine Black, BA ’15, is working in economic consulting at a small firm in Alexandria that handles airport and airline clients. Brooks Boron, BA ’14, will graduate this May from the Ohio State University Moritz College of Law where he currently serves as the editor-in-chief for the official law journal for the American Bar Association's Section on Dispute Resolution. Rich Brown, PhD ’94, has served as the FDIC's chief economist since 2003. He has recently focused mostly on community bank research and enhancing the economic analysis that goes into the FDIC's rule making process. Catherine (Lahovski) Burns, BA ’05, is an officer in the United States Marine Corps. She is a pilot flying KC-130J refueling aircraft and has completed multiple deployments during her enlistment. Philip H. De Turk, BA ’54, currently resides in Pinehurst, N.C., where he enjoys golf and bridge. He practiced law for 50 years in Washington state before moving to his present home. Peter Estridge, BS ’09, left the Marine Corps in 2015 with the rank of captain. Peter then enrolled in the University of Chicago Booth School of Business MBA program. This summer he will begin a role as an investment banking associate with Merrill Lynch. Kerri Evans, BA ’14, has spent the past two years as a managemeny consultant in the financial services industry. Kerri's work has ranged from large scale transformation initiatives to digital strategy development and execution. Wayne Farel, PhD, BA ’82, teaches economics at Colorado Mountain College in the Vail Valley and is a national ski patrol mountain host. Wayne is also a private global investor. Mason Fulling, BA ’16, accepted a position as a consultant with Pricewaterhouse Coopers LLP in D.C. in their Public Sector Practice. Sean Gaffney, BA ’10, relocated to Houston, Texas, shortly after graduation in 2010. He has been with Shell for six years, completing his MBA at Rice University in 2015 and is now a senior economist in the Corp M&A group at Shell E&P. Margaret Gibson, BS ’12, will be leaving her role at Deloitte Consulting to pursue an MBA at the MIT Sloan School of Management. Eiji Goto, MS ’16, received an MS degree along the way to his PhD degree. Right now as a PhD student at GW he is working on forecasting performance of Dynamic Stochastic General Equilibrium models. Roger Heldman, BA ’78, spent his career in the public safety uniform industry and is now a consultant. He resides in Cincinnati, Ohio. Evan Hillebrand, PhD ’81, recently retired from the University of Kentucky and now lives in Cambridge, Maryland. He recommends his new book, Energy, Economic Growth, and Geopolitical Futures (MIT Press, 2015). Ann Hollingshead, BA ’08, graduated from the University of California, Berkeley with a master's degree in public policy in 2015. She is now a fiscal and policy analyst for the California Legislative Analyst's Office, where she works on state budget and economic issues. Zhaoyang Hou, PhD ’10, is teaching at Georgetown University Qatar as assistant professor of economics. Monica Huddleston, BA ’75, was mayor of the City of Greendale, Mo., for eight years, from 2003 to 2007 and 2011 to 2015. Before that she spent 25 years at SBC (now AT&T) before retiring as director of central operations, Eastern Missouri. She now volunteers in church and the community. Nayantara Jacob, BA ’14, is doing her master's in international affairs, concentrating on financial and economic policy at Columbia University. Patricia Kanashiro, MS, PhD ’08, ’13, is an assistant professor of international business at Loyola University Maryland in Baltimore. Akash Katakam, BS ’16, is currently working for Defined Health, a boutique strategy consultancy with clients in the biotech and pharmaceutical industries. In his free time, he is involved with local politics, keeping fit through yoga and joining the Freemasons. Roli Khare Rastogi, BA ’03, is co-founder and immigration law partner at Basso & Khare LLC, a premier law firm based in Jersey City, N.J., serving individuals, entrepreneurs, small businesses and startups. Usman Ali Khilji, BA ’99, worked for ABN AMRO Bank after graduating. He completed a MS in economics at the University of Edinburgh in 2004. While pursing his doctorate in economics, he was hired by the World Trade Organization. 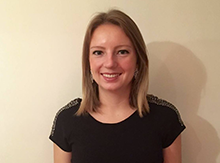 Ava Lazor, BS ’16, works as a research analyst for The Cadmus Group, an environmental consulting firm in Arlington, Va. She also continues to serve as a teaching assistant for the Geology Department at GW. Cody Lee, BA ’13, runs the marketing department for a company that was founded on the production of entertaining econ videos. Amanda Lintelman, BS ’09, completed her MBA from Emory University's Goizueta Business School in May 2016. She remains in Atlanta working as a strategy & operations consultant for Slalom. Bernardo Lopes da Costa, BA ’16, is working at the World Bank as a consultant. Tim Mahedy, BA, BS ’07, works at the Federal Reserve Bank of San Francisco as an economic analyst. Lutonadio Masala, BA ’14, just finished his master’s degree in economics and finance from the University of York. Michelle Migdalovich, BA ’16, is a federal business analyst at Deloitte Consulting. She is currently on an IRS project that focuses on data analytics and financial modelling. Gerald Miller, MA ’88, has been doing interesting work in healthcare productivity and quality improvement close to her home in Pennsylvania after 26 years as a frequent business traveler. Wun Cheun Na, BA ’89, is working for SamsungPay, Inc in Boston as VP and COO. Greg Nelson, BA ’78, was recently elected chairman of the board of directors of Houston Methodist Hospital System, a seven-hospital system with over 2,000 operating beds. He also chairs the Houston office of Paul Hastings, LLP, an international law firm. Erin Lynn Nephew, MA ’04, has begun teaching International Political Economy as an adjunct professor at NYU's Center for Global Affairs. She is also a senior vice president, Global Country Risk Management, at Citigroup. John Northington, BS ’15, works in the Manhattan office of Paul, Weiss, Rifkind, Wharton & Garrison LLP, within the firm's private equity and hedge fund group. Trey O'Callaghan, BA ’14, will graduate from Duke Law School in May, and he will begin work as a corporate associate at King & Spalding in Atlanta in September. Jorge Ordenes, BA ’65, has retired from the IMF and now resides in Vienna, Va. He writes articles for the Bolivian press. Ryan Orsini, BA ’15, is working on his Master of Science-Data Science at GW. Rustin Partow, BS ’11, is a third-year PhD student in economics at UCLA focusing on labor economics. Edgar Peden, BA ’81, M.Phil ’85, PhD ’87, worked for Medicare from 1989-2004 and retired in 2004. He wrote What's Behind Out-of Control Health Spending in 2012. Rupinder Sabharwal, BA ’08, co-founded a product called Analyzo.com, which helps startups and small businesses find and compare the best software and internet services. Felipe Sandoval, BA ’80, opened his own business importing and distributing hardwood flooring after 20 or more years in international banking. He lives in Tampa, Fla.
George Santopietro, BA ’78, became assistant provost for academic operations at Radford University, Radford, Va., in July 2016. Josh Serchen, BA ’16, is currently involved in health policy work as the health policy/communications coordinator with the American College of Physicians. Kevin Sette, BS ’16, is still living in Washington, D.C., tutoring students in various undergraduate economics courses. He is currently in the process of selecting his law school of choice, which he will start attending in fall of 2017. John Shahin, BS ’00, joined Citi after graduating GW and has progressively advanced over 17 years. He is currently the U.S. business head for Citigold Private Client, where he oversees a $7 billion balance sheet. John also has an MBA in finance from Fordham. Adam Shapiro, BA ’09, recently graduated from Columbia Business School and London Business School at the end of February. He received MBA degrees from both institutions. Erica Soultanian, BS ’14, is currently working as a program analyst at the Office of the Deputy Mayor for Economic Development and Planning in D.C. She previously was an analyst at NERA Economic Consulting. Charles Stewart, BA ‘46, MA ’48, PhD ’54, is writing the last chapter in his next book, The Culture of Discovery and the Propensity to Invent: A Comparative Analysis of Civilizations. Vito L Tanzi, BA ’91, is an assistant professor of health policy and management at the American University of Beirut where he teaches courses in health economics, ethics and health finance. Daniel Uslander, BA ’77, is an industrial metals specialist for High Ridge Futures LLC in their New York office. He develops and implements hedging solutions for metals recyclers. Shaun Vaid, BS ’12, moved to St. Louis after working for 4 years in healthcare M&A in Miami, Fla. He is now a senior financial analyst with BJC, the top healthcare provider in Missouri. Patrice Vogelman, BA ’81, is living outside of Boston in Cohasset, Mass., and is working for Verizon. 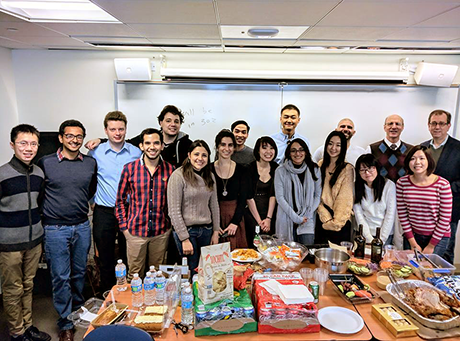 The Economics Department would like to gratefully acknowledge the following generous donors who made a gift to the department and its various funds from January 1, 2016 to December 31, 2016. The department is also happy to report that the PROFESSOR ROBERT M. DUNN, JR. MEMORIAL ENDOWMENT FUND has reached a total of $68,625. Income from the fund will be used for a $1,000 prize for an undergraduate studying International Economics as well as other purposes determined by the Economics Department Chair to honor Professor Dunn, including research, enrichment, travel, etc. In addition the ECONOMICS ALUMNI ENDOWED SCHOLARSHIP FUND was created to provide a scholarship for graduate students enrolled in CCAS pursuing an advanced degree in economics that demonstrate financial need. The Economic Alumni Endowed Scholarship Fund is totaling $95,727. You can make a gift directly to the Economics Department or you can designate it to one of our many funds listed below. Your gift to the Department of Economics will be considered a part of Making History: The Campaign for GW, a comprehensive, university wide philanthropic effort to raise funds in support of GW’s vision and priorities. To learn more, please visit the Making History: The Campaign for GW website.